What started as a weeklong celebration in a California School District in 1978 became National Women’s History Month by a Congressional resolution in 1987. Today there are a multitude of activities and celebrations to highlight the ways women have overcome trials and shaped our world. We’ve chosen some insightful, and immensely readable, fiction and non-fiction to highlight this month–and don’t overlook Women Explorers and May B., by our featured authors! Links to additional information and activities about Women’s History Month follow these reviews. 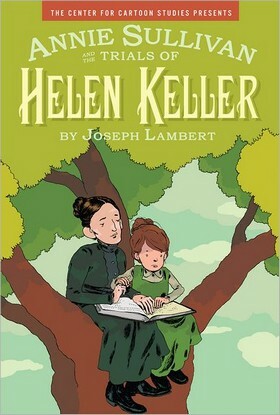 Lambert’s graphic novel focuses on the early years of the relationship between Helen Keller, who had been blind and deaf since she was a toddler, and her live-in teacher, Annie Sullivan, a young woman whose own visual impairment and pedagogical instincts gave her insight on how to reach and educate the unsocialized child. Many readers will already be familiar with the story, particularly the famous breakthrough moment at the water pump and Helen’s insatiable curiosity and rapid accrual of vocabulary and syntax. Perhaps less known, however, is the bitter episode on which this title ends, in which Helen and Annie are accused of plagiarism after Helen’s published story, ‘The Frost King,’ is discovered to be a close retelling of another work. Lambert relies heavily on a layout of sixteen frames to a page, a stylistic choice that allows him to slow the action and zero in on the painstaking effort involved in acquiring and transmitting information by finger spelling, an effect that’s informative if a touch monotonous. More successful is the book’s frequent use of an amorphous suggestion of Helen’s shape on a black background, which helps the reader assume Helen’s paradoxically sightless ‘view.’ A bibliography is included, but readers will be more immediately drawn to the closing notes, which coordinate with specific passages to supply additional background. Suggest this title in conjunction with Lawlor’s Helen Keller: Rebellious Spirit (BCCB 9/10) and Delano’s Helen’s Eyes. Review Code: R — Recommended. 2012, Disney Hyperion, Ages, 9 to 13, $17.99. Reviewer: Elizabeth Bush (The Bulletin of the Center for Children’s Books). Chickadee and Makoons, the twin sons of Omakayas, are devoted to each other and have been inseparable since birth. The mischievous brothers play a trick on the brutish sons of the mean-spirited John Zhigaag who then kidnap Chickadee in revenge. Suddenly the young boy is thrown into a difficult predicament when the brothers abandon him to his own resources. Drawing on the strength of his namesake, the small but powerful bird, Chickadee must find his way home on his own. It is a trek filled with danger from missionaries who want to convert him to survival in the deep forest. It is not until he comes across an ox cart caravan and his uncle Quill that Chickadee is safe at last. Omakayas and her family have travelled to the Red River to await Chickadee’s return and it is on the Great Plains that they will make their new home. Alternating chapters chronicle Chickadee’s adventure juxtaposed with his father and Aunt Two Strike’s search for him and his mother’s vigil at home with a mourning Makoons. This sometimes causes the story to suffer a loss of momentum as it shifts from the dramatic pace of the journey to the more quiet reflection on the home front. Erdrich has used her incredible storytelling skills to weave a tale written with grace and eloquence. Ojibwe culture and lore are seamlessly woven into the engaging story that is accessible to young readers. Difficult scenes such as Chickadee’s interaction with the missionaries are handled with dignity and aplomb. Readers who have come to love Omakayas may be disappointed with her lesser role in this novel. The glossary of Ojibwe words does help the reader wrap his tongue around the complicated syllables. This may be the fourth book in “The Birchbark House” series but it does stand on its own and will make an excellent read aloud and discussion choice for classrooms. 2012, Harper, Ages 8 to 12, $15.99. Reviewer: Beverley Fahey (Children’s Literature). Tension builds from the first line that Julie Beaufort-Stuart (code name Verity) writes after she is taken prisoner by the Gestapo in France. A small gesture led to her capture and now she is writing to extend her life. Torture, and the mere threat of torture, play a part in this tale, and Julie recounts that in her writings. She has promised to tell all she knows about the British War effort. What’s more, she knows the gruesome death that awaits secret agents. Her wartime friendship with Maddie Brodatt and how their plane was shot and crashed are recounted in the notes she makes. The second half of the story is told from Maddie’s perspective, and the two friends find themselves back together in a stunning conclusion. This World War II novel is rich in discussion material: the setting; the characters; and the themes of heroes and cowards, friendship and hatred, irony, truth, and more. Nothing is quite as simple as it seems, however. Wein deftly weaves their gritty, compelling, complex story which lingers long after the last page is read. 2012, Hyperion/Disney, Ages 14 up, $16.99. Reviewer: Sharon Salluzzo (Children’s Literature). Although her name is not as familiar as Cesar Chavez’s, Dolores Huerta was just as important in the movement for migrant workers’ rights. Each spread introduces an important role in her career. We learn about Dolores as a teacher . . . detective . . . friend, and learn how Huerta became aware of what life was like for the migrant workers’ children in her classroom. Moved by the injustice of what she learned, the story goes on to tell how Dolores is a warrior, organizer and peacemaker as she helped organize and publicize the strikes that eventually lead to legislation protecting the right to fair wages and conditions for migrant workers. 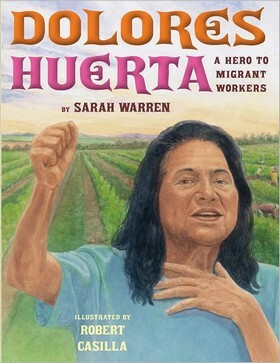 While this is a complex topic for young children, the simple but evocative text and the realistic full color illustrations will give them a good idea of the important work to which Huerta has devoted her life–work that is of such importance that the author is donating a portion of books proceeds to a migrant workers organization. 2012, Marshall Cavendish, Ages 7 to 10, $17.99. Reviewer: Mary Hynes-Berry (Children’s Literature). In 1941, thousands of men in the U.S. quit their jobs to fight in World War II. Women rallied to the cause to fill these jobs, but in a segregated society rooted in racial discrimination, African American women were often denied access. Segregation rules even kept some from volunteering for unpaid positions. Mullenbach describes the upward struggle of African American women to participate. Ironically, as the nation fought for democracy and freedom overseas, African Americans were denied such freedom at home. In 1942, the Pittsburgh Courier, a black-audience newspaper, started the “Double V” campaign–V for victory at war; V for victory at home. Not all blacks embraced this campaign, according to Mullenbach, but it “gave some black people the courage to act.” Hattie Duvall carried a protest sign when denied service at a restaurant. Pilot Willa Brown started a black flight school. Protester and young teacher Thomasina Walker Johnson Norford became an influential lobbyist. Ethel Bell, who was refused employment after passing a civil service test, traveled to Washington, D.C. to complain. Others fought to join the military, although once they were accepted, they often faced unfair practices. Nursing was only open to white women at first, but persistence paid off. As nurses, African American women served stateside and overseas; although segregated and assigned to black soldiers only, they more than proved their worth. Black female entertainers faced similar hurdles. Black actress Hattie McDaniel was denied housing in a white neighborhood despite her contributions in boosting military morale. On the other hand, black singers Margaret Simms and Josephine Baker (also a spy) were well received by all in Europe. As war workers, political activists, volunteers, military personnel, and entertainers, black women “broke race and gender barriers to help win” the war. Double Victory is an excellent resource on black women’s contributions to World War II and the beginnings of the Civil Rights Movement that would come (1955-1968). 2013, Chicago Review Press, Ages 12 up, $19.95. Reviewer: Sharon M. Himsl (Children’s Literature). Gloriana June Hemphill is eleven and soon to be twelve years old and living in Mississippi in the days of the Freedom Riders. The author does an amazing job of presenting all the issues of racial integration during the 1960s while still maintaining the eleven-year-old point of view. The story begins with Glory befriending the Yankee daughter of a doctor at the free clinic. Her new friend, Laura, doesn’t realize or care that some facilities are meant for whites only. Glory’s beloved swimming pool is closed days before her traditional poolside birthday party. She’s saddened, angered, and confused by the closing. Is it because of invisible cracks or because of a planned integration? Glory’s sixteen-year-old sister, Jesselyn, has a new boyfriend, Robbie. He’s visiting his aunt because he dared eat next to a colored friend at a North Carolina lunch counter. Glory’s life is further complicated by her old friend, Frank, whose family the reader can identify as racist; by her colored maid, Emma, who is like a mother to Glory; and by her preacher father, who wants to do the moral thing. The subtle ways the issues are demonstrated make this an enjoyable and readable book. As Glory’s father, Brother Joe, says, “Books don’t care who reads them.” 2012, Scholastic Press/Scholastic Inc, $16.99. Ages 9 to 12. Reviewer: Sue Poduska (Children’s Literature). “Outrageous. Unbelievable. 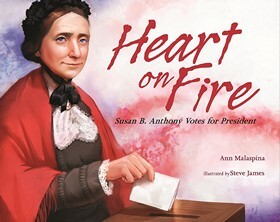 True.” Readers have several opportunities to join the repeated, indignant chant in this lively picture book account of suffragist Susan B. Anthony’s 1872 attempt to take the Fourteenth Amendment at its word and cast her vote in a national election. After wearing down her local registration inspectors, she musters a cohort of like-minded women to join her at the poll, drops her ballot in the box, and dashes off a note to her friend Elizabeth Cady Stanton: “Well I have been & gone & done it! !” Within two weeks, she’s under arrest, released on bail, and scheduled for trial, which she loses. Malaspina brings Anthony’s crusade to light via this tightly focused, fast-paced effort. She opens with a comparison of the text of the Fourteenth and Nineteenth Amendments which, with careful reading and perhaps a bit of helpful unpacking by an adult, clearly establishes the incongruity of an anti-female reading of the earlier amendment. She closes by giving the defeated Anthony the last word: “‘I shall never pay a dollar of your unjust penalty.’ And Susan B. Anthony never did.” James employs in his illustrations the sedate browns, rusts, and deep blues that instinctively connote propriety of times past, but he also interjects a strong undertone of subversive whimsicality in his almost photorealistic faces, allowing other detail to blur slightly into the background while all attention is focused on the unflappable Anthony and her blustering antagonists. A brief historical note, selected bibliography, photograph, political cartoon, and reproduction of Anthony’s letter to Stanton (magnifying glass recommended) are included. Review Code: R — Recommended. 2012, Whitman, Ages 7 to 9, $16.99. Reviewer: Elizabeth Bush (The Bulletin of the Center for Children’s Books). The story of Josephine Baker, star of the jazz age, is told in blues form and rhyme, punctuated in places with lines like, “Boodle-am boodle-am SHAKE!” and “Zee-bu-dop zee-bu-dop ZOW!” Winter does not minimize the hardship of Baker’s youth when she danced to make money, nor the horror when white townsfolk set fire to the black area of St. Louis. In New York, Baker is finally a hit, but she finds the roles she plays demeaning. In Paris she at last finds satisfying fame with her dancing and singing. Priceman visualizes the jazzy emotions with enthusiastic strokes of gouache and black ink. The youthful Baker is all curves on the jacket/cover with large eyes and a swirling feather in her hair. A leopard at her feet adds to the overall exotic tone of the biography. The double pages present more examples of jazzy movements with male and female dancers in oranges and yellows with hints of purple architecture. The visuals supply the emotional content to the brief verses. A note adds background information about Baker. 2012, Atheneum Books for Young Readers/Simon & Schuster Children’s Publishing Division, Ages 4 to 8, $16.99. Reviewers: Ken Marantz and Sylvia Marantz (Children’s Literature). In this follow-up to the Breadwinner trilogy, set five years later, Ellis revisits her strong, 15-year-old heroine, now living in post-Taliban Afghanistan. The novel alternates between Parvana’s struggles in an American prison (she is a suspect in an explosion at her mother’s school) and flashbacks to her life before capture, first as a student at the school and then as a teacher. Though Parvana understands and reads English fluently, she refuses to speak (“She knew she could not trust them. All she could trust was herself”), silently enduring sleep deprivation and harsh interrogation. In the flashbacks, Ellis strongly sketches family tensions, including a betrayal by Parvana’s sister Noori and Parvana’s complicated relationship with her mother. A scene in which Parvana’s discovery of an injured American soldier foils her near-escape underscores her compassion and morality. The resolution is perhaps too tidy, but Ellis succeeds in putting a human face on the headlines and the brutality of the Afghan war, while answering many questions about the fate of a heroine whose personality and force of will shine through. 2012, Groundwood, Ages 11–up, $16.95. Reviewer: Publishers Weekly. Pioneering Women, offering middle school level historical thumbnail biographies of women, is the latest release in the ‘True Tales of the Wild West’ series. Highly appropriate for reluctant readers, Pioneering Women contains thumbnail biographical sketches of famous women of the American West in the 1800’s. Both Western Native American women and white pioneer women are featured in the biographical material; The heroic (unsung) roles of women in the Westward expansion are explored. Carry Nation, Sacajawea, Calamity Jane, and many more historical figures are presented, with black and white photos and illustrations. In addition, “Pioneering Women” has a Glossary, Bibliography, and Chapter Notes added at the end. 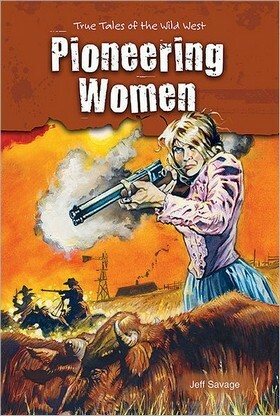 “Pioneering Women” is sure to secure the attention of middle school reluctant readers of both sexes. Look forward to upcoming titles in the same series. . .2012, Enslow Publishers, Ages 11 up, $15.95. Reviewer: Midwest Book Review (Children’s Bookwatch). Miller (Thomas Jefferson for Kids) offers a comprehensive look at the lives of pioneer women, both in general and specifically, who bravely ventured to the American west in the mid-19th century. Seven detailed chapters delve into such topics as harrowing trail journeys (“omen hardened to shocking sights–seeing the dead lowered into graves without coffins or funerals, watching haunted people tramping home after giving up the struggle…. Young ones wandered off or fell and were crushed beneath wagon wheels”), the hardships of homesteading life, frontier entertainment, and female political activism. Fascinating, mini-biographies of 16 women round out each chapter, incorporating excerpts from letters and journals. Readers meet former slave Clara Brown, who amassed an entrepreneurial fortune in Colorado but lost it helping others, as well as Donner Party survivor Margret Reed, whose story is harrowing, as are those of two women held captive by the Comanche. Missionary and army wives, widows and entertainers–all impress and inspire as they survive, sometimes thrive, and carve out new lives for themselves. B&w archival illustrations and photographs punctuate the text. 2013, Chicago Review Press, Ages 12–up, $1995. Reviewer: Publishers Weekly. 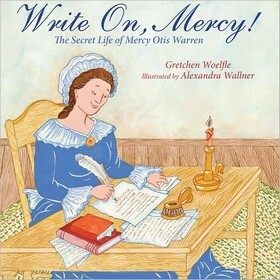 Although young readers may not recognize the name Mercy Otis Warren, she is brought to life in this brief illustrated biography by an author and illustrator who are both veterans in publishing historically based books for young readers. Drawn in large part from primary source materials, including the letters of Mercy Otis Warren, this story recounts the work of an intelligent educated woman who sought to make a difference when women were still effectively barred from participation in political life. Encouraged by her father and later her husband, Mercy read widely and was passionate about the revolutionary politics in which the men of her family were involved during the latter part of the 18th century. She also wrote and published poems and plays which appeared anonymously in broadsheets and newspapers of the time; eventually she completed a three-volume history of the Revolutionary War which was published in 1805–finally under her own name! Excerpts from her writings are interspersed with the storyline. An author’s note about Mercy, a copy of her portrait by renowned painter John Singleton Copley, a timeline and an excellent list of readings and sources follow the text. This would be a very accessible accompaniment to discussions about the war, about the evolution of women’s rights in the United States and even about the importance of civic participation. 2012, Calkins Creek/Boyds Mills Press, Ages 8 to 12, $16.95. Reviewer: Paula McMillen, Ph.D. (Children’s Literature). Next Next post: Common Core & Preschoolers: All Work and No Play?